The White Swan and on the left, The Seven Stars. The road to the left is Bath Street with Dudley Street on the right. Several years ago whilst researching family and local history I decided that I wanted to see how the long gone pubs of Walsall would have looked to my ancestors. I embarked on a series of watercolour and gouache paintings of hostelries based on black and white photographs. 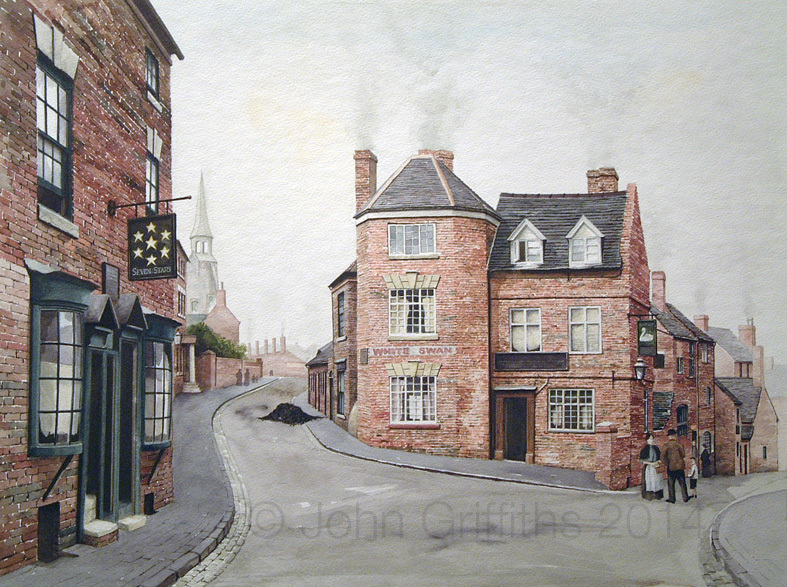 One of the first paintings I did was of The White Swan that sat on the corner of Bath Street and Dudley Street, where the Mercedes garage is now situated. This turned out to be two paintings in one as on the opposite side of the street stood the Seven Stars Inn, but first the White Swan. The licensed victuallers list for 1783 has Thomas Carless as the licensee, in 1818 a Joseph Carless, presumably his son, had taken over. In 1834 Joshua Roper was in charge and seventeen years later the job was in the hands of John Osbourne, a collector of the poor rate and auctioneer. Between 1888 and 1927 the White Swan had eleven licensees, Mary Bonas, Jabez Hill (1890) William Vann (1891) John Hanley (1892), Edward Smith (1894), Benjamin George Tuck (1895), John Toon (1897) Bernard Dagman (1898), Arthur James Breakwell (1924), Harry Salt (1924) and Thomas Ernest Bland (1927). In 1897 Benjamin Tuck was fined 40/- (£2) plus costs for supplying drink out of hours. During John Toon’s tenure the magistrates went to town with him, he was fined £5 plus 3 Guineas costs for selling gin above maximum price, a further £5 for not exhibiting a Public Bar notice and another fiver for selling spirits from unmarked receptacles. In 1925 a survey of the premises stated, ” White Swan shows and old brewery plant and a barrel store and is described as a very old property in fairly good repair generally except club room, small bar, smoke room and tap room badly ventilated”, plans were submitted for the necessary alterations to be made. Planning permission was granted the following year and the work carried out. Around the time of the alterations the average trade was around 254 barrels a year, wines and spirits 60 gallons at 5/- (25p) per gallon and 3,000 bottles sold, presumably this meant bottled beers. The improvements to ventilation lasted only a short time in the overall life of the pub as around 1935 the Swan was closed and the license transferred to the Green Rock Tavern, new premises in Bloxwich. On the left side of the painting is the Seven Stars Inn, a Georgian building with bow windows that curved both horizontally and vertically. In 1834 it was classified as a beerhouse with John Thomas the licensee. Nine years later Thomas Lynes, a spur tackle maker, was mine host. In 1851 there were conflicting reports as to who owned it. It was now categorised as an inn/tavern, this list had it registered to John Partridge, but the census of that year has its owner as 32 year old George Johnston a victualler and tailor. The answer to the confusion in ownership could be as simple the premises were in the process of changing hands. In later years the premises were owned by Henry Moseley, Messrs. Downing of Smethwick and J. W. Brookes. Licensees were listed as John Hinton Alsop (pre 1887), Bery’n Francis Wood (1887), Edwin James Warner (1888), John Morgan (1892) and finally William Horton from 1893. The Seven Stars was reputed to be a rival to The Jolly Bacchus pub a short distance away in New Street and many of the great and good of Walsall gathered there! Having read about that area of the town, probably the not-so-great and definitely not-so-good of Walsall also frequented the place too! It was reputed to have a very fine Queen Anne fireplace and grate in perfect condition but this was removed before it lost its license around 1900. In between the two buildings the school house and spire of the Bath Street Council Schools can be seen. Just behind the White Swan, on the left, are the alms houses which are still there today. Details about both pubs is taken from the excellent book, Walsall Pubs – A History by the late John Cockayne published in 1984. You are currently reading The White Swan and Seven Stars Inn at Walsall Life.